At CMI, we get a lot of them, and we answer them in blog posts, interviews, one-on-one conversations, etc. We (still) are often asked what content marketing is, how brands truly find success, and how to get started. We field a lot of questions about how to generate leads with content marketing, but our answer isn’t focused on leads — it’s about the real value in building a subscriber. Why are companies using content marketing? What are the benefits? How do we convince the management team that content marketing works? How long will it take to see positive results from the program? Our company wants to bring in more sales leads. How can content marketing help us do that? What are the best ways to build an audience with content? How do we measure the effectiveness of content marketing? Why are some companies successful with content marketing while others are not? How do we determine whether the company should buy or build a content platform? 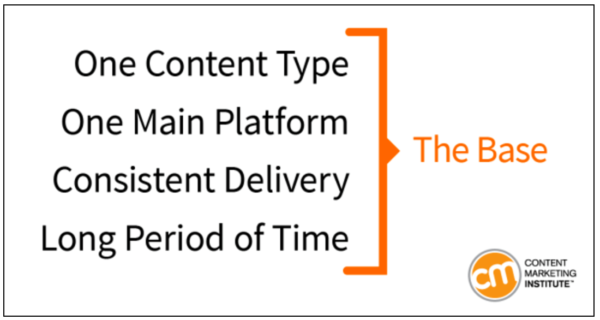 What’s the content marketing technology stack, and how do we build it? Our organization is new to content marketing — where do we start? Even if you already know the answers, you can use the e-book as your go-to resource for co-workers, managers, and industry peers who may be asking questions. Sometimes, it just takes the same answer said in a different way or from an independent third party — or repeated for the eighth time — to make an impact. As a quick note, while these questions have been asked by marketers at brands, anyone in content marketing can benefit from the answers. Now for a glimpse at four of the 10 questions. Content marketing is the process to provide truly relevant and useful information to your prospects and customers to help them address important challenges. This is different than traditional marketing efforts like sales collateral and other product-specific information. Content marketing includes things like educational articles, e-books, videos, and webinars that answer specific questions people have. By becoming a credible, authoritative resource on topics that matter to potential customers, your business is more likely to get discovered by the right audience and earn their loyalty and trust — which, in turn, enables your brand to strengthen its customer relationships, grow an active and engaged subscriber base, and even increase its profits. 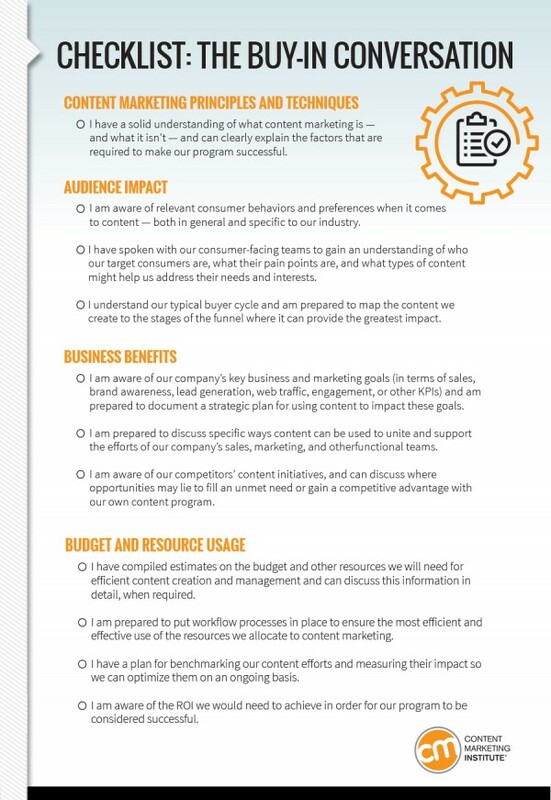 Download the e-book to get the key reasons people use content marketing with an example of each. How do I convince my management team that content marketing works? Many people want to know how to prove content marketing is more effective than a direct approach, such as producing traditional advertising collateral and sales pitches. Just as if you were to make the case for anything, you need to understand what your manager cares about most, then present your argument in terms of how content marketing can address — or even alleviate — some of those pressing concerns. It may also be helpful to support your argument by pointing to the success that other businesses like yours have achieved through content marketing. Share examples from competitors and other relevant brands whenever possible to make a bigger impact than theories and assumptions alone could do. The e-book goes into the four key ways you can get buy in. Getting new leads is a huge need for many organizations. What makes people more willing to give their contact information or even more personal details? Content that is genuinely useful, answers their questions, or serves their needs in other ways. While we often get asked about leads, we put more faith in the power of the subscriber. A lead is simply someone who discloses some information in exchange for a piece of content or something else of value. A lead is not a definitive indicator of interest in an ongoing conversation with your business — in fact, a lead may not even have an active interest in your products or services at all. On the other hand, a subscriber is someone who signs up to receive regular communication because they believe you have something valuable to offer them — and you’ll continue to provide this value beyond the initial engagement. In other words, they sign up in anticipation of the value they expect to receive in the future. What might help is to first think about building an audience through subscription, then mine that subscription list for leads (as the audience engages in your pieces of content). You’ll likely find that those leads will be MUCH more valuable and likely to buy if you nurture them over a longer time by delivering real value outside the products and services you offer. Learn the key difference between given and gathered data — and how this distinction helps you build a better audience — in the new e-book. Focusing on one content type before diversifying keeps brands from overextending themselves before they really understand the needs of their subscribers. The e-book goes into more detail on what type of audience you want to build and what steps to take. How do I measure the effectiveness of content marketing? Before you can determine the effectiveness of your content, you need to define what success means for your organization, then decide which key performance indicators show whether your content efforts are moving the needle in the right direction. If you are uncertain where to start, we suggest measuring success by tracking your subscribers and measuring how their behavior differs from non-subscribers. For instance, do subscribers spend more money for certain products or services? Are they more likely to advocate on behalf of your brand? 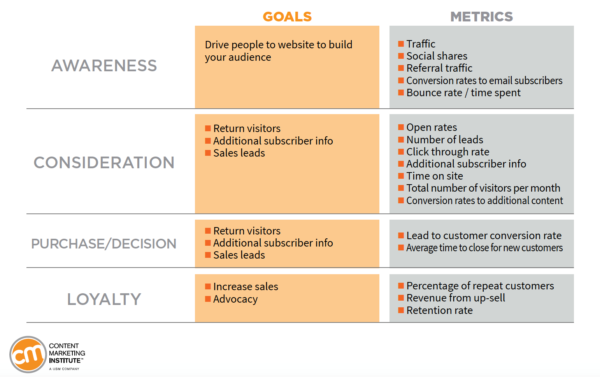 While there is no one right way to measure the success of your content marketing program, this chart indicates some common goals and metrics based on where in the sales cycle you want traction. 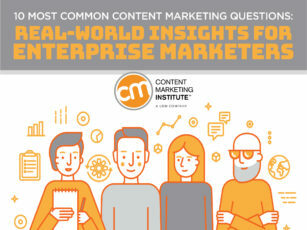 To get more actionable advice on the four questions above and answers to all 10 questions, download the e-book, 10 Most Common Content Marketing Questions: Real-World Insights for Enterprise Marketers. What other questions do you have? I’d love to hear from you! Just respond in the comments or reach out to me via Twitter @michelelinn. Or, if you’ll be at Content Marketing World, I’d love to catch up with you in person. Want to get more answers and/or share your questions with Michele Linn, register for Content Marketing World Sept. 5-8 in Cleveland, Ohio. Use code BLOG100 to save $100.